We started buying "Prepper food". You know, the kind that is supposed to be good for 25 to 30 years? They come in envelope packets, or cans or even boxes. We bought one 72 hour supply that came in it's own plastic ammo bucket with a convenient carry handle. We even found one that feeds 4 people for 4 days. 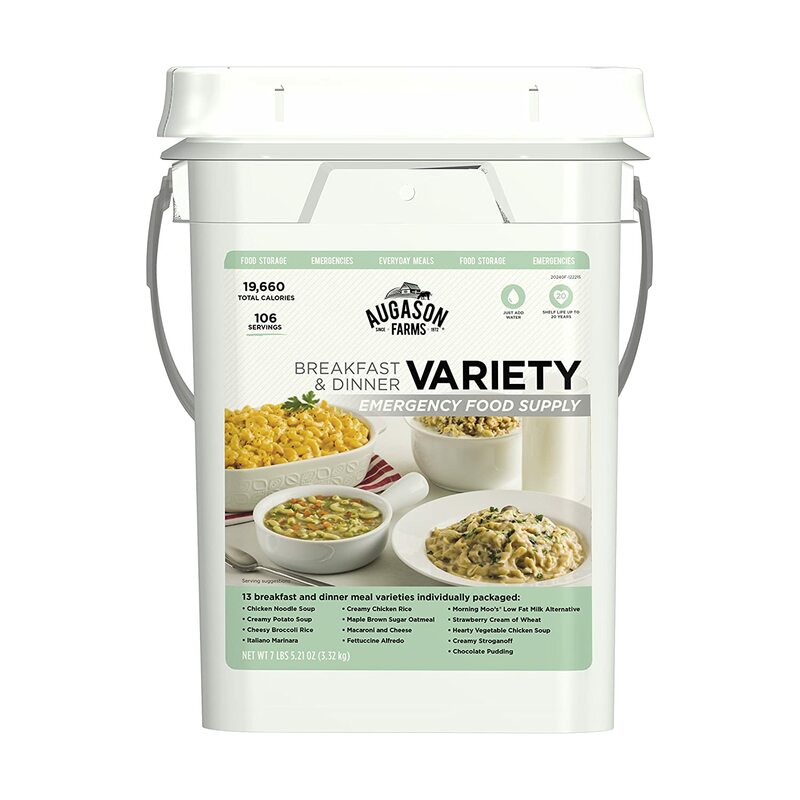 You can also go big and buy a one year supply, breakfast, lunch, and dinner. "Augason Farms", and "Mountain House". We are following package directions and discovering what is easy and what is not so easy. What is delicious and what just won't work for us. We also have a camper, so we are testing to see which meals and or sides, desserts etc. would be worth using on our glamping trips. Travel days usually call for a dinner meal that's fast and easy so, we started with those. Let me start by saying that unless you want military MREs, your disaster is going to have to leave you with the ability to at least boil water. The simplest, easiest, least messy meal we've found so far cooks in it's own pouch, but it does have to cook. It requires 2 cups of boiling water. So if you're prepping for the apocolypse, you should probably go with MREs (Meal Ready to Eat). We're more prepping for a mini apocolypse where the stores run out of food (like before a hurricane or after a big tornado). 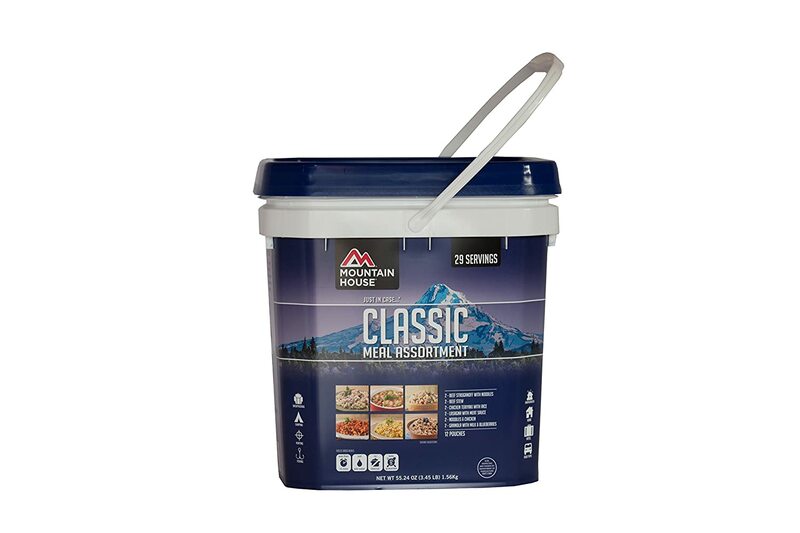 We try to keep things as simple and easy as possible, so we started with the "Mountain House" brand which can be purchased as individual packets at WalMart. They have single servings, 2 person packets and 2.5 person packets. We went with the 2.5 because... we like to eat. Our first meal was Beef Stroganoff and I cooked some veggies to go with. We're not in a crisis right now and there's no reason to suffer just to test these products. Besides, this way if the stroganoff was nasty we'd at least have some good veggies to eat. The package was easy to tear open. No scissors needed. and it had a zipper lock inside. Boil 2 cups of water. Pour that in the pouch and stir. Stir again in 4 minutes. Serve in another 5 minutes or eat from the pouch. Easy Peasy. It didn't smell like my strogonoff, but it didn't smell nasty. We sat down to eat after serving it up on real plates. We looked at each other with moderate trepidation. Were we sure we wanted to try this? Del went first. He didn't spit it out which I took as a good sign. I breathed a sigh of relief and tried a bite. It was surprisingly good. The beef was a little chewy, but not offensively so. We agreed that it would be a good choice for a fast meal on a travel day in the camper. And it was filling. We probably could have gotten by without the veggies. "You didn't doctor this?" Del asked because I'm famous for never cooking anything the same way twice even if it came from a box. "No," I said. "This is completely by the instructions, but I have some onion powder here if you want to spice it up." We'll be buying more of the Mountain House Beef Stroganoff. Next time: Teriyaki chicken and rice. We'll eventually be setting up a comment section. In the mean time, if you enjoyed this email Linda and let her know you want more.